It seems N-power has not enable the HTTPS redirection on the npvn website and we think it is very important they do. Hypertext Transfer Protocol Secure (HTTPS) is an extension of the Hypertext Transfer Protocol (HTTP) for secure communication over a computer network, and is widely used on the Internet. If you want visitors to access your blog over HTTPS, you can turn it on. 1). It helps check that your visitors open the correct website and aren't being redirected to a malicious site. 2). It helps detect if an attacker tries to change any data sent to your website visitor. 3). It adds security measures that make it harder for other people to listen to your visitors’ conversations, track their activities, or steal their information. 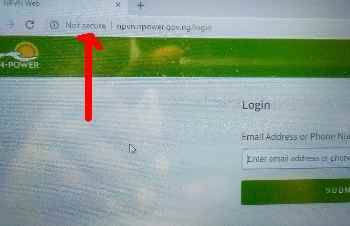 If you notice when browsing the internet, some website are tag secure with a green lock key symbol at the beginning of the website address while some are tag not-secure. Website that are using https are the ones tag secure while those using http are tag not secure. It is very important that you develops trust with those visiting your website for the first time, and the only way you can do that is by enabling the https in your website domain.